First, my disclaimer: I’m totally stealing this idea from Entertainment Weekly. In this week’s issue, several famous authors shared their “ultimate bookshelf.” I thought this was a fabulous idea and collected all of my favorite books from their various shelves and nightstands around the house to take the photograph above. I’m sure there are a few of my favorites missing – ones I’ve loaned or lost – but off the top of my head I can’t think of any glaring omissions. I was very pleased to find most of my most beloved books (some of which you can see are also quite well-worn) were available for show-and-tell. 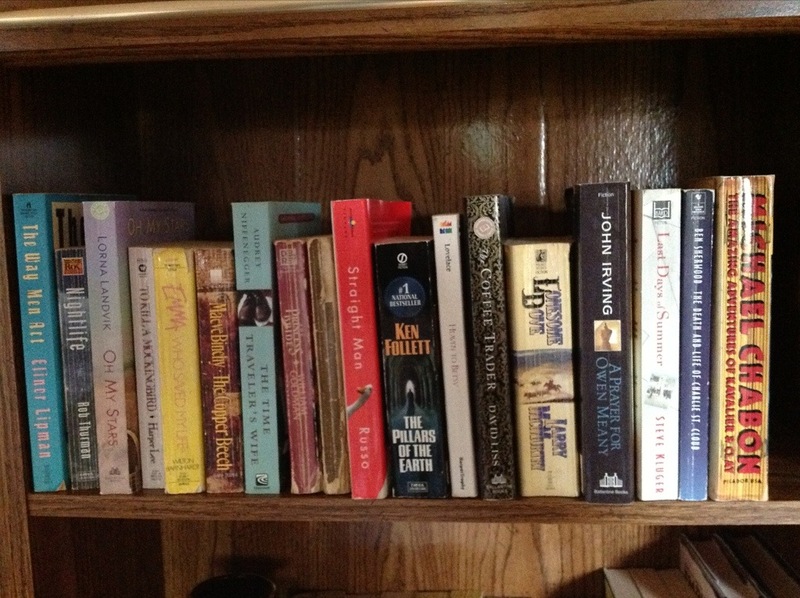 Some are classics and everyone would agree they deserve a place on any bookshelf. Other books may have made my list because of the mood or the place I was at in my life when I entered the author’s world. Perhaps there was a character or a location or a situation that was important to me at that one moment of time. Who knows – I may have just found myself touched by a book for some inexplicable reason. Still, I’ll take a stab at explicing… um… I mean explaining my love for the books listed above. The Way Men Act – Elinor Lipman: I have read all this author’s books, but The Way Men Act was the first and the one I find myself returning to most often. It tells the story of people who act with emotion instead of logic when it comes to matters of the heart, which only makes them more real and believable. I can only hope to bring a fraction of the wit, warmth and quirkiness to my writing that Lipman brings to hers. NightLife – Rob Thurman: I have a confession: I am a huge fan of supernatural/fantasy writing and at the very top of my list is the Cal Leandros series by Rob Thurman. If you haven’t read anything by this author, but are a fan of this genre, please go look it up. Cal, his brother Nico and their friend Robin Goodfellow are among the most interesting characters you’ll run across. Not a traditional hero, Cal often makes the wrong choices. When he does end up doing the right thing, it is often due to love and loyalty for family – not an innate sense of goodness. I find complicated, semi-dark characters like Cal far more interesting than their white-hat counterparts. Oh My Stars – Lorna Landvik: Much like Lipman, I’ve read everything by this author and love the rich and interesting characters she creates. Oh My Stars is my favorite, but it was a dead-heat between this book and Patty Jane’s House of Curl. I truly did laugh, cry and walk away feeling like I’d made new friends after reading this book. This is a book where the main character loses an arm in an accident, and that is probably one of the least interesting things about her. To Kill a Mockingbird – Harper Lee: Do I really need to explain? The world’s greatest literary hero in Atticus Finch and fiction’s most clever, funny, contemplative, poignant child in Scout. Every word is a treasure. Emma Who Saved my Life – Wilton Barnhardt: This might be my most obscure pick. It is a very good book that didn’t make much of a splash when it was published, but it certainly made a splash in my life when I read it. It paints a portrait of New York in the late 70s – and the lives lived there – that this small-town girl from Maine may not have known existed but for this book. Another reason I love this book is that it contains one of my favorite lines ever. The narrator, looking back over his life with the difficult and fascinating Emma says: “…Emma, who saved my life from being unexciting and half-lived a lot of the time: there I’d be, teetering on the brink of normalcy, of averageness…of happiness. And Emma you’d pull me back every time.” Who can say that they have not had an Emma in their life? Copper Beech – Maeve Binchy: This was a difficult choice only because Maeve Binchy is one of my favorite authors and I easily could have picked any one of half a dozen books to count among my favorites. This one made the list primarily because of the effortless way she weaves multiple stories and characters that I first thought were completely distinct only to realize at the end how they intersect. The Time Traveler’s Wife – Audrey Niffenegger: I have found that some people love this book while other hate it or find it difficult to get into. There really is no middle ground. Perhaps one of the reasons why it’s so divisive is because this book tells a convoluted story that jumps backward and forward in time, all the while speeding toward a conclusion you just know can’t end favorably. I was fascinated by this story and found it so meaningful because the author creates a fairly fantastic world, but within it places two real, grounded people who set forth on a truly timeless love story. The Princess Bride – William Goldman: You may have seen the movie, but you haven’t lived until you’ve read the book. It is hilarious, warm, romantic and just different enough from the movie that both must be experienced. I started this book on a Friday night the summer before I went to college and read it all the way through in one 24-hour period. I’d read Goldman’s non-fiction accounts of his life as a screenwriter, but was not prepared for his beautiful prose. Zoe’s Zodiac – Mary Jo Stephens: You can tell from the picture just how well-loved this book is by the fact that the spine is all but obliterated. Zoe’s Zodiac is a young adult book I first read in my early tweens and continue to re-read on a regular basis. It was perhaps the first book I remember where sad things happen and actions have consequences, but they are laid out in a manner that very gently ushered me into the world of adult literature. Straight Man – Richard Russo: I know… you probably expected Empire Falls to be on a list of favorites that included Russo, and I don’t disagree. That is also a wonderful book, but the protagonist in Straight Man is far more interesting in my opinion. He is deeply flawed, but continues to keep battling against the negative influences in his life in a way that you can’t help but admire. Pillars of the Earth – Ken Follett: I’ve read a ton of Follett books and I’ve loved most, but not all of them. Pillars belongs in a separate category only because its subject matter is so different from anything I’d ever read and probably anything that Follett had ever written up to that point. This is the book that kept me up late and woke me up early to keep reading. I was equal parts anxious to see how it ended and devastated when it was over. Heaven to Betsy – Maud Hart Lovelace: I once devoted an entire blog posting to my love for the Betsy/Tacy series, so I won’t go into too much detail here. Let me just say: I love, love, love the character Betsy Ray and would like to be her when I grow up. The Coffee Trader – David Liss: I love historical fiction and I love even more a story that can take a complex plot and break it down in a way that doesn’t make the reader feel dumb. Instead, I felt like I was learning and discovering along with the main characters. This was another book that I couldn’t put down and spent every spare moment (and quite a few moments I didn’t have to spare) with my nose buried in it. Lonesome Dove – Larry McMurtry: I read Lonesome Dove on an airplane from Portland, ME to Spokane, WA in the summer of 1996. When I got back to Maine a week later, I drove from the airport directly to Blockbuster to rent the mini-series. McMurtry is another author who can tell a multitude of stories all at the same time, draw the reader into each individually, and then slowly start to pull all the strings together. Usually when I read such a hefty book, I wonder if the author could have trimmed it down a bit. Coming in at around 800 pages, I would have been content with another several hundred so that my journey with Augustus and Woodrow didn’t have to end so soon. A Prayer for Owen Meany- -John Irving: A few years ago I was asked to join a bookclub and this was the first selection. I’d never read anything by Irving – probably a bit intimidated by the amount of critical acclaim he received – but I gamely dug in and was so glad that I did. Owen Meany is perhaps one of the loveliest characters I’ve ever met, but he doesn’t overshadow that circle of fully-fleshed supporting characters who surround him. The Last Days of Summer – Steve Kluger: This book is unique in that it is written as a collection of letters, news clippings and telegrams that tell the story of a major league baseball player and the young boy he befriends. Clever and funny, this book will also break your heart in the best possible way. The Death and Life of Charlie St. Cloud – Ben Sherwood: Yes, yes, I know. They made a Zac Efron movie out of this book. I can’t emphasize enough the fact that you should not blame the book for that unfortunate fact. This is a lovely story of a brotherly bond that is not severed by death. It is about love, loyalty and letting go of what you know and trusting that better things exist just around the corner. It is a huge tear-jerker if you haven’t figured it out already, but not in an emotionally manipulative way. This book earns every tear it wrenches from you. The Amazing Adventures of Kavalier and Clay – Michael Chabon: This book may very well be the grand poobah of all my favorites. It didn’t win the Pulitzer Prize for nothing. It is a fascinating story, a walk down a particularly interesting avenue in history and Chabon creates truly original characters. You root for them even when they make mistakes because they are so flawed and simply human that you understand why the mistakes are made. So, that’s my list. A few Pulitzer Prize winners. A few children’s books. Loads that have made the leap from book to movie. Now it’s your turn. Did I get it right? Are some of my favorites yours as well? Did I list a clunker that you’d like to argue or miss a gem that you’d like to publicize? I’d love to hear your thoughts in the comments below! It sounds very clever – I’ll check it out. Thanks! Two of my favorite (to add to your great list) include “A Sport and a Pastime” by James Salter and “A Place to Come To” by Robert Penn Warren. Well! Now I totally have to steal this idea from you! 🙂 We intersect with “The Princess Bride”. So wonderful. And I’m in the hate camp of “Time Traveler’s Wife”. Thanks to you, I’ve ordered Rob Thurman’s books… I also love fantasy/supernatural. Have you read CE Murphy’s series that starts with “Urban Shaman”? My VERY favorite fantasy series is the Newford books by Charles de Lint. Anyway, thanks for the idea and the read! I’ll check out that series too! Thanks! I think we have actually. I love that you love this book too ! Lonesome Dove – WOW. I’m not a big “western” reader, but seriously, wow. Wonderful storytelling. To Kill a Mockingbird, Pillars of the Earth – Is it possible that more than 20 years have passed since I read these? (Yes, it is.) I need to re-read these because I know I liked them the first time, but I’ve forgotten a lot of the details. Princess Bride – A boyfriend bought this book for me in college! (How can you not adore a man who is this romantic?!) Sadly, he was all romance (in the sense of living in a world of fantasy, not sweeping me off my feet, exactly) and no realism – bye bye. The book was a keeper, though. I liked Time Traveler’s Wife. I think it shows that “magic realism” isn’t exclusive to Latin-American literature. And I read and reviewed The Amazing Adventures of Kavalier & Clay earlier this year! http://themainepageturner.blogspot.com/2012/06/amazing-adventures.html Have you read his Yiddish Policemen’s Union? I’m so glad we have so many favorite books in common! I’m with you on the westerns, but then you consider he also wrote Terms of Endearment and The Last Picture Show, so McMurtry just crosses genres all over the place. I’ll check out your review! I have read the Yiddish Policemen’s Union & didn’t like it quite as much. I LOVED Wonder Boys, though. Actually, I will be introducing the movie Wonder Boys at the Portland Public Library on 11/10 and then talking about writing and the transition from books to movies. I’ll send you information as soon as there is more publicity around it, but definitely pick up that book! The 10th? That’s next weekend! I’d better get crackin’!